Always a crowd pleaser, the Rho Ophiuchi nebula is one of the most beautiful and colorful areas of the sky. 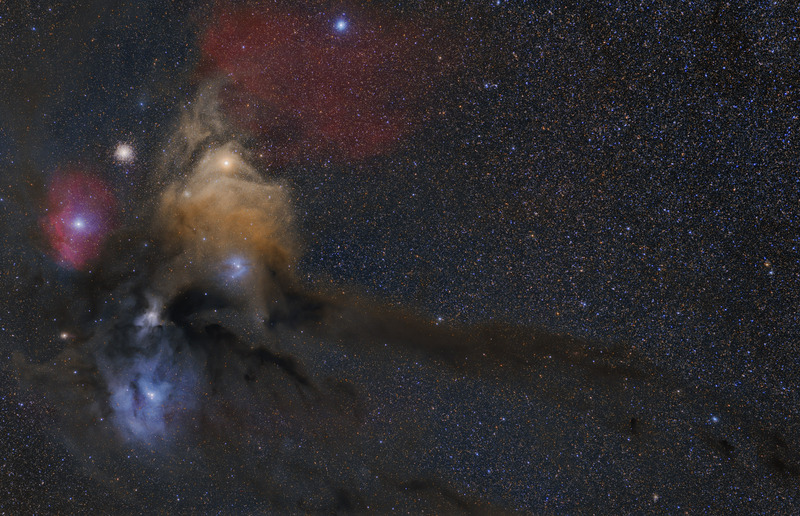 Rho Ophiuchi, towards the bottom left in this image, is the bright triple star that is surrounded by the blue reflection nebula IC 4604. At the left of the image, the blue star Sigma Scorpii is surrounded by an intense red hydrogen emission nebula, Sh2-9. To the upper right of Sigma Scorpii is the large globular cluster M4. Despite its apparent association with the surrounding nebulae, M4 is actually a much more distant background object. To the right of M4 is the brightest star in the image, the red supergiant Antares. The name Antares means "rival of Mars", and visual observation makes it obvious that Antares has a reddish yellow color very similar to the planet Mars. Antares is so large that, if it were at the center of our solar system, its outer atmosphere would reach to the orbit of Jupiter. Antares' strong stellar wind has created the relatively cool yellow nebula IC 4606 that seems to engulf the star. Above IC 4606 and below the bright blue star at the top of the image (Tau Scorpii) is the very faint red hydrogen nebula RCW 129. Just below IC 4606 is another blue reflection nebula, IC 4605. This nebula is reflecting the blue light from the star it surrounds, 22 Scorpii. This amazing field of view is punctuated by the dark nebula B44. Commonly known as The Dark River, this nebula is created from dust that is in front of the surrounding nebula and causes us to see it in silhouette. In this image, North is down. Software Used Images Plus 5.75 for camera control, calibration, stacking, digital development, star shrinking and halo reduction, smoothing and noise reduction. Photoshop CS5 used for levels and curves, high pass filter, star shrinking, screen mask invert, lab color, vibrance, saturation adjustments, selective color, and match color. HLVG for addiitonal color correction, Gradient Xterminator for gradient removal. Carboni Tools for additional noise reduction, and smoothing. Registar for aligning stacks. Notes While I've photographed this area previously, this was the first light image for my new Hutech modified Canon 6D. The 6D is a full frame camera, so the field of view with any given lens is 1.6x wider than with the 450D. I also had Canon work on my 200mm lens. It now produces extremely sharp stars across the entire field of view of the full frame camera. As such, I was in a better position to gather quality data. So far I'm very impressed with the low noise characteristics of the Canon 6D. It looks like its going to be a big contributor to improving my astrophotos. This image was published by Astronomy Magazine as its Picture of the Day for June 29, 2015! This image won first place in Astrophotogallery.org's Easy-Widefield category for July 2014. This image was published and featured in the August issue of On Landscape Magazine, a periodical for professional landscape photographers.